There’s been a lot of discussion by the public and the media over the past couple of years about the value of the Major Cycle Routes programme. That’s perhaps to be expected; $160-odd million is a lot of money for any project, especially something relatively untested here like high-quality cycleways. With that in mind, it’s good to see that Christchurch City Council have been doing some surveying of the biking public to see what they think so far of the new cycleways. 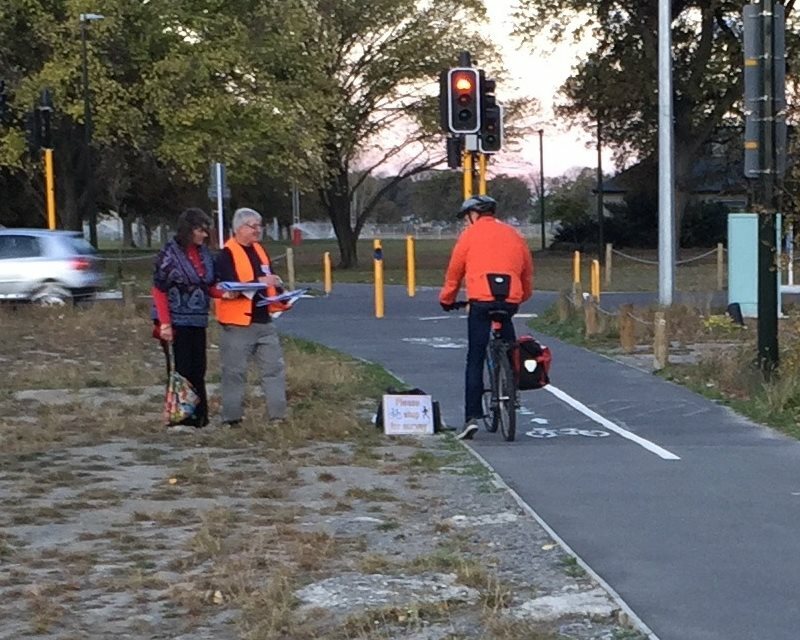 You might have seen the surveyors on the Uni-Cycle, Little River Link and Papanui Parallel routes in Oct-Nov, intercepting people riding along them and asking them a few questions. And now the findings of these first surveys are being presented at this week’s Infrastructure, Transport & Environment Committee meeting. 625 people responded to the interview surveys; encouragingly 40% of the respondents were female. The first question asked “How much do you agree that the new physically separated cycleways have: improved my safety when travelling by cycle / made it more comfortable to travel by cycle?” As you can see from the results below, overwhelmingly respondents agreed with these statements, by 94% (perhaps some of the disagreeing folk are from the existing cyclists camp?). 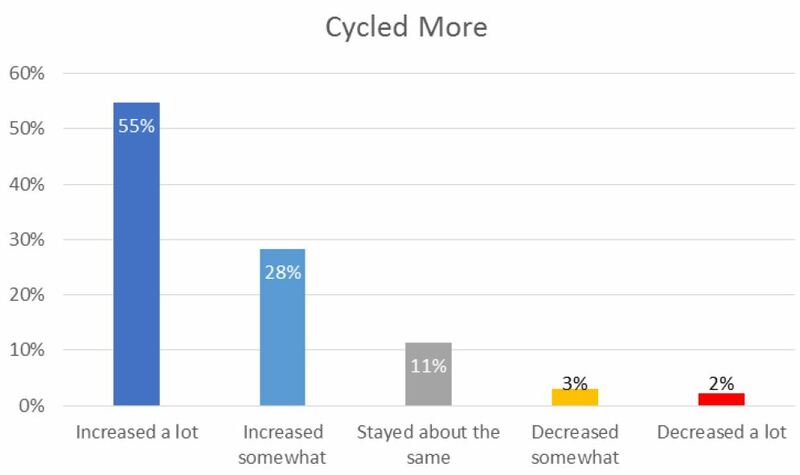 Another question asked “Thinking about your cycling in Christchurch over the past 12 months please indicate how your travel by cycle has changed as a result of the availability of more separated cycleways.” Again, it can be seen that the cycleways had a positive effect, with 83% of respondents reporting more cycling. 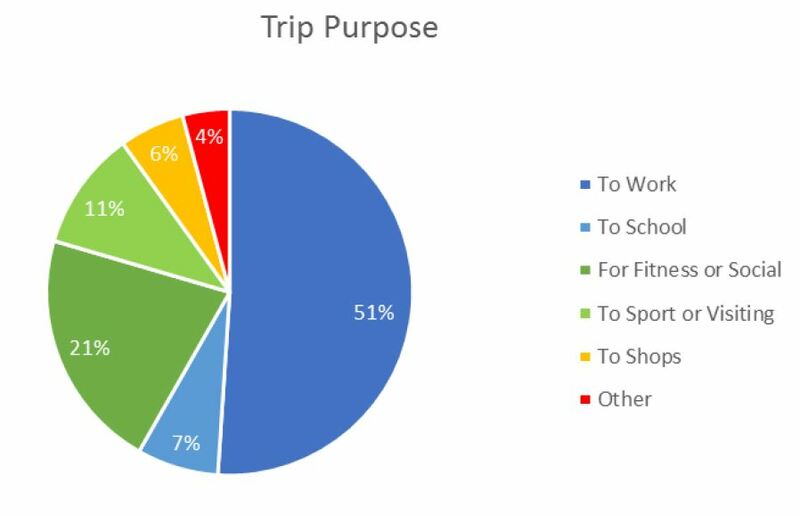 Survey participants were also asked what the main purpose of their cycle trip that day was (note that these surveys were carried out at each site on a weekday afternoon and a weekend). The importance of the cycle routes for utility trips like work, school and shopping comes through, 64% of trips falling into these categories. Recreational or social rides were only about a third of all trips, despite many people’s belief that cycling is just a recreational “hobby”. Probably the most interesting question was “Before the new cycleway was built, how would you have made this trip?” While about a third would have cycled their trip using the same route, 43% would have taken an alternative route (and indeed, in some cases, there would have been no choice if the cycleway provides a new link previously unavailable, like Grassmere-Rutland). Of real interest though is the fact that 15% stated that they would have previously driven by car instead if the cycleway wasn’t available. That is great evidence for the travel mode-shifting benefits of the new Major Cycle Routes. 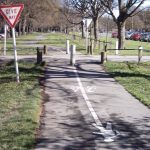 The survey also asked “How much do you agree that physically separated cycleways like this should be installed on routes throughout Christchurch?”, and 92% of the respondents either strongly agreed or agreed with this statement. I find this question a little problematic, because separated cycleways are not always the best answer to a particular route, e.g. on a quiet street a neighbourhood greenway would be perfectly appropriate. Indeed, two of the routes surveyed feature such treatments for parts of their length. Judging by some of the recent confusion about the work on the Rapanui-Shag Rock route, we still have some work to do to explain to the public how greenways work. The full report behind these surveys will be completed and made available publicly before the end of February 2018. It is intended that these surveys will be an ongoing series, so it will be interesting to see what people think about the cycleways over time. What do you think of the Major Cycle Routes so far? 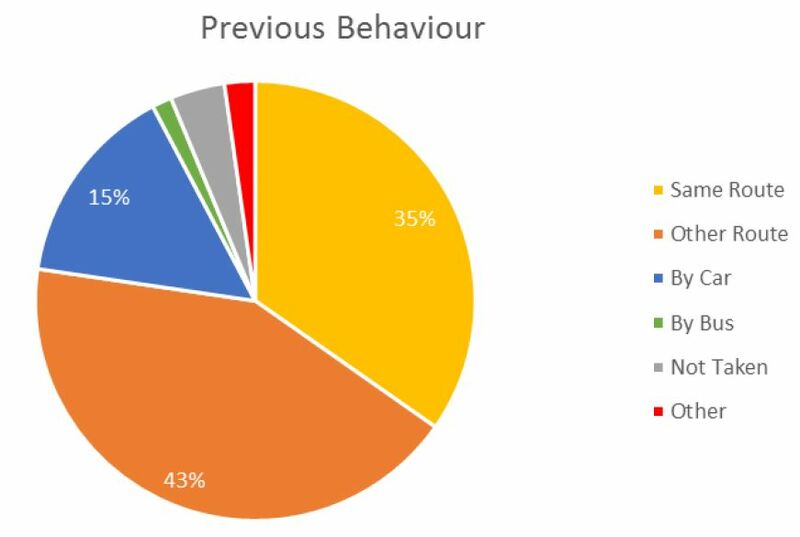 Firstly, fantastic results from the surveys. The new bridge has been delayed, because it hadn’t actually been budgeted for; not ideal in the short term, but still on the cards hopefully when the new Govt turns its attention to the Urban Cycleways Programme again. At the Asia-Pacific Cycle Congress there were some pretty clever cheaper composite bridge structures being shown off and I think there was interest in using one of those to save money over a conventional steel one. I don’t recall seeing any reduction in cycle priority along the route – where? The urban cycle-ways programme has produced a flurry of fantastic cycleways throughout NZ cities. The Christchurch ones are generally well designed and well connected routes for people on cycles who will use them in increasing numbers. They are a delight to cycle along and feel so much safer and more enjoyable than being mixed up with busy motor car traffic. “Go by bike” is an excellent map of the lot published by the city council. The money spent is significant but is overshadowed by the budget for roads. More and more people on bicycles will encourage the new government to extend the programme for another three years, which was recommended by the previous Transport Minister but rejected by the Finance Minister. We are a long way behind Copenhagen, Holland and Germany but what a national, leap forwards we have taken. Sawyers Arms Road is now more dangerous for vehicular traffic thanks to a virtually unused, pristine cycle way occupying about 1/3 of the width of the road reserve and lights being installed, The carriageway part of the road is patched and in desperate need of repair. East bound cyclists can be seen on the road probably because crossing to the right into the cycle lane is dangerous. It’s an example of very poor planning and a waste of ratepayers’ money. The cycleway occupies less than 1/6 of the roadway, whilst still retaining two footpaths, two parking lanes and two traffic lanes typically 3.5m wide. I understand that there is still some issues with the phasing of the Sissons Dr signals (e.g. very short times for cyclists to cross); a not insurmountable problem to deal with. Don , I would doubt that Ecan judge the success of one of their bus routes by the numbers getting off at the end. More accurate to tally who was there at the start and who got on and off during the journey. Until the Northern Line Cycleway is extended through to Northwood opening up more commuter suburbs to the CBD, writing off a small section of the network is premature in my opinion. I understood that the previous Shirley Papanui Community Board was recommending changes at the Sissons Road /Sawyers Arms Road intersection anyway in response to difficulties experienced for traffic to enter and leave Northlands Mall. Signals improve the safety for all road users. Traffic on Sawyers Arms Road was able to go very fast due to it being wide, straight and open. Slower speeds help all road users , particularly pedestrians and children.